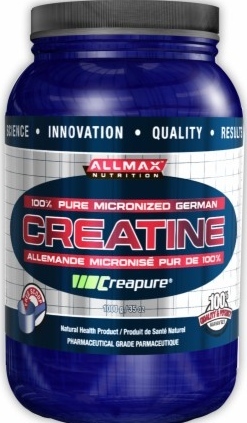 AllMax Nutrition Micronized Creatine Monohydrate can help to build lean muscle mass, while improving strength, power and overall performance by stimulation of protein synthesis. What can you say about it.....Its just creapure ceatine and a good price. Put it in your shake and go. If you need your creatine to have flavor or extra BS, just put about 10 packets of Emergency into it and you have a 60$ product for 20$. Cheap effective and it works. I usually just mix it in my shakes. Lasts forever! It's cheap and it's creapure, so it doesn't destroy my guts like other creatine mono. My favorite creatine product. - It is Creapure creatine which is supposed to be the best- It absorbs well- Cheap as hell - Doesn't cause bloat issues that I've had with some creatine- Doesn't give horrible gas like some creatines do to me.I keep it as my staple creatine because it is creapure it is .02 a serving. No creatine has ever worked for me even at higher dosages. Hence why I've given it a 4 rather then a 5.
i been a fan of all max for awhile now and ever since i switched to their creatine i never got another product just love the results i been getting quality is great!!!! Best bang for buck creapure, but it could have been micronized further for ease of use. A very good quality creatine at a very good price. I highly recommend it to anyone looking for a top quality creatine at a good price.